The Lexus LS is a large four-door luxury sedan that's shaped the automaker for decades. It is the product that launched the brand in 1990, and sent a shockwave through the industry that this upstart Japanese brand could build a true luxury car. In nearly 30 years on sale, it's set the pace for quality and durability regardless of price tag. With the LS, Lexus relies on quiet luxury and a coddling interior to vault itself into consideration as a rival for the Mercedes-Benz S-Class and BMW 7-Series. For 2018, the Lexus LS was new—an overdue update to what was no longer really feeling like a flagship. 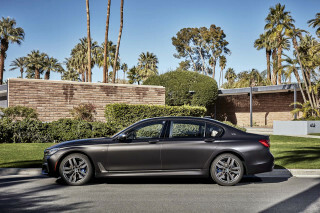 That's all history, the latest LS can keep pace with the megabuck luxury class with organic shapes and high-tech amenities that can run with the Germans for now. In 2019, updates were few, though the LS added Apple CarPlay. Lexus revealed the fifth-generation LS at the 2017 Detroit auto show. It's based on a lengthened version of the GA-L platform that it shares with the stunning new LC sports coupe. Lexus says the platform lowers the car's center of gravity and centralizes the mass. Additional high-strength steel, as well as aluminum, have been used to remove about 200 pounds from the platform. Braces in the engine compartment and stiff front and rear suspension towers add strength to the structure. Two engines were available at launch including a new twin-turbocharged 3.5-liter V-6 that produces 415 horsepower and 442 pound-feet of torque. The engine is mated to a new 10-speed automatic transmission (also shared with the LC) that Lexus claims can shift as quickly as a dual-clutch transmission. Lexus quotes a 0-60 mph run of 4.5 seconds. A 3.5-liter V-6 and electric motor combo that made 354 hp is mated to a multi-stage hybrid transmission and nets up to 28 mpg combined. New multi-link suspensions are found front and rear. Optional suspension components include active sway bars, air suspension, and rear-axle steering. The styling is a bolder than LSs of the past. Longer, lower, and wider than the outgoing model, the car has a more imposing stance, and the added length allows the greenhouse to extend to the rear in a teardrop shape with six windows instead of four. Only one length is offered and it's an inch longer than the long wheelbase version of the last generation on a wheelbase that is 1.3 inches longer. Exterior details include a chrome-outlined version of the Lexus spindle grille, headlights with wing-shaped LED signatures, and taillights with Lexus L signatures. Inside, the LS features organic shapes influenced by Japanese wood working patterns. The materials are a sea of wood, metal, and leather, and they are accented by ambient lighting. The dashboard has a 12.3-inch screen for the Lexus Remote Touch control interface, which now supports handwritten inputs. Active noise cancellation is also standard. Among the new tech features are a color head-up display that Lexus says is the largest on the market, a pedestrian detection system with active steering that can detect a pedestrian in the lane ahead and steer around them while staying in the lane, and an access mode for the available air suspension that lowers the car and opens up the seat bolsters. 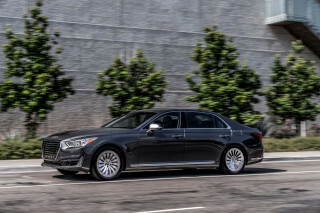 The LS also comes with the Lexus Safety System+, which features forward collision warnings with emergency braking, lane departure alerts, automatic high beams, and adaptive cruise control. Interior options include a 3-D Mark Levinson sound system with in-ceiling speakers; 28-way power adjustable front seats with heating, cooling, and massage functions; rear seats with heating, cooling, and a massage function, plus a right side rear seat ottoman with a reclining seat. In its first generation, which spanned from 1990 to 1994, the Lexus LS 400 changed the way American shoppers perceive Japanese brands. Introduced at the 1989 Detroit auto show (alongside the Infiniti Q45), the first Lexus LS 400 was a warning shot fired across the bow of BMW, Benz, and Cadillac. It offered all the luxury-class bona fides of the competition—with fanatical attention to fit and finish, new dealerships with top-drawer customer service, and what some considered a lowball price meant to lure buyers away from other brands. It worked: The LS drew several best-of awards, gained a reputation for extreme durability, and essentially launched the brand, though a smaller ES 250 sedan gave dealers something else to sell besides the $36,000 LS. While it wasn't lauded much for handling, the LS's sewing-machine-smooth V-8 engine helped give the car the quietest cabin of any luxury sedan, aided by a smooth 4-speed automatic. The combination provided a 0-to-60-mph time of about 8.5 seconds. In its second generation, which ran from the 1995 to the 2000 model year, Lexus upped power in the V-8 to 260 hp. It didn't look very different from the first LS 400, but the new car reportedly shared only about 10 percent of its components with the original car. More powerful than before, the LS 400 also was lighter and quicker than before, with an estimated 0-60 mph time of 7.5 seconds and a top speed again limited to 155 mph. New features included an in-dash CD changer; the base price had risen to more than $50,000. In 2000, the LS received side airbags and stability control, before a new vehicle arrived in 2001. For the third generation, which appeared in the 2001 model year and was offered through the 2006 model year, Lexus uprated the V-8 engine. The new V-8 displaced 4.3 liters and put out 290 hp and 320 pound-feet of torque. A new control-arm suspension all around with a sport package was offered. The new car had an estimated 0-60 mph time of 6.7 seconds, an improvement over the prior version. An air suspension was offered, as was a touchscreen LCD panel that operated the navigation system. A Mark Levinson sound system came as an option, as did ventilated front seats, massaging rear seats, and adaptive cruise control. Curtain airbags and parking sensors were standard. The price of this Lexus LS began in the mid-$50,000 range, but top versions cost as much as $70,000, neatly overlapping the prestige brands from Europe. In 2004, an updated version received a 6-speed automatic to go with the carryover V-8 engine and also added knee airbags and a choice of interior trim, including maple wood, along with new options such as Bluetooth connectivity and a rearview camera. The fourth-generation LS arrived in the 2007 model year; base LS 460 sedans and LS 460 L long-wheelbase versions came with a new 4.6-liter V-8 with 380 horsepower, teamed to a new 8-speed automatic. Still rear-wheel drive, the LS grew longer and adopted the "L-finesse" styling theme that would appear on subsequent Lexus vehicles, carrying a graceful, feminine look. 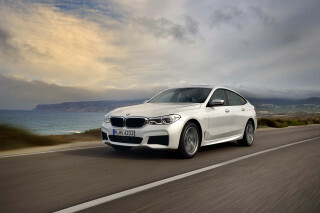 Long-wheelbase editions added nearly 5 inches to the overall length of the sedan, and a new multi-link suspension replaced the former design. 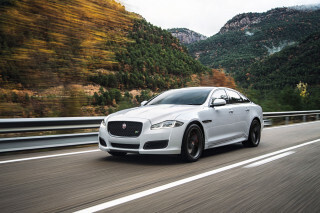 Performance increased again, with 0-60 mph times estimated at 5.7 seconds for either the short- or long-wheelbase sedan. 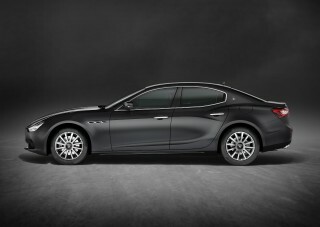 New interior features included keyless ignition; hard-drive navigation; a heated steering wheel; and real-time traffic. An "executive" package for the rear seat added DVD screens in the headrests, fold-down tray tables, and massaging seats. Over its lifespan, the LS has added features such as an automatic parking-assist feature and a lane-departure warning system, both of which were advanced for their time. Lexus added a hybrid to the LS lineup for 2008. Called the LS 600h L (and offered only in a long-wheelbase version) it paired a 5.0-liter V-8 with batteries and electric motors for total system output of 439 hp. Unlike most Lexus and Toyota hybrids, the gas-electric LS didn't get amazingly improved fuel economy as compared to its gas-only counterpart—it used a larger engine after all—and it was also very expensive, at a base price above $100,000. The idea instead was to provide greater performance without a fuel-economy penalty, with the quiet motoring of brief EV sprints as an added touch of luxury. Lexus updated the LS family's styling slightly in 2010 with new bumpers and wheels. As always, the model bristled with gas or hybrid powertrain technology, exuded world-class fit and finish, and kept driving dynamics well-muted as it hit mid-life. 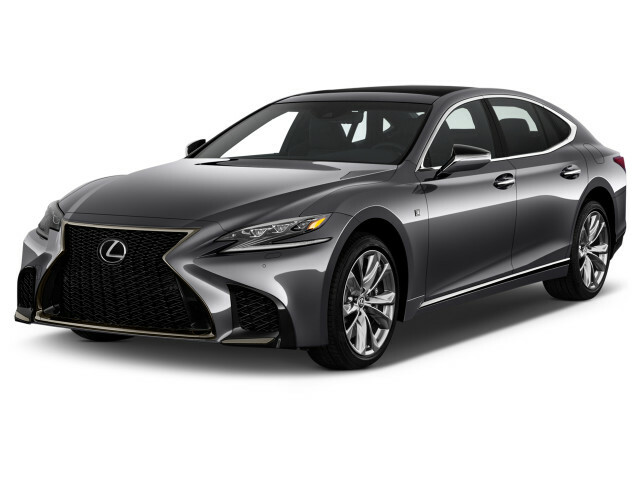 For 2013, a new performance-oriented LS 460 F Sport model joined the lineup, and the rest of the LS models fit in with the family look, getting Lexus's latest "spindle" grille. The F Sport brought improved handling, Brembo brakes, and paddle shifters for the Sport Direct Shift transmission it shared with the former Lexus IS-F.
For 2017, Lexus dropped the slow-selling hybrid but kept most of the LS lineup and options packages the same. A Major Upgrade - Lexus Hits a Home Run!